In modern astronomy researchers not only observe celestial objects, but also build them in computers and follow their evolution over time. These simulations reveal exciting new insights that – of course – have to be validated by observations. In the last few weeks, members of PlanetS published new results about comets, giant planets and earth-sized objects, all based on computer simulations. Journalists reporting about space science know the argument by heart: Studying comets is important because these objects are primordial and therefore, give us information about the formation of our solar system 4,5 billion years ago. Answering questions about our origin is an argument that sells well. No wonder it has been published by newspapers and magazines countlessly since the European Space Agency ESA has launched Giotto to encounter comet Halley 30 years ago. And now – were we all wrong? In November 2016, Martin Jutzi and Willy Benz of the University of Bern published two papers based on computer simulations showing that comets like Rosetta’s Chury are hardly more than a billion years old. In the run-up to the publication, some experts expressed doubts. But surprisingly the new result doesn’t mean that there is no primordial material in the comet. So the story might be more complicated than we have assumed for decades. See: “Chury is much younger than previously thought”. 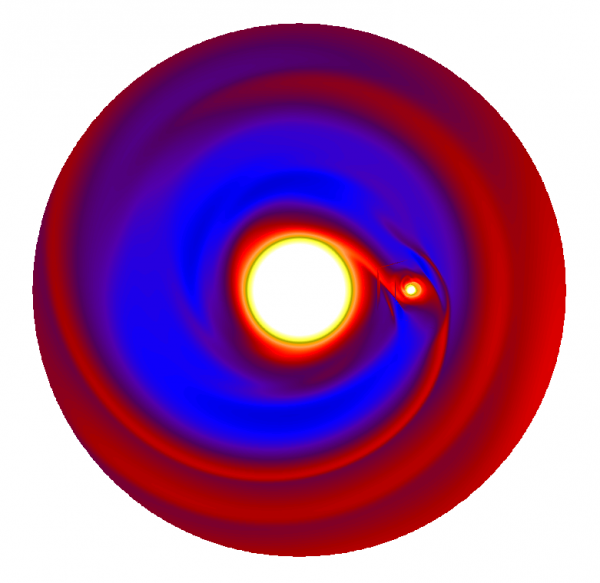 Other computer simulations by Yann Alibert and Willy Benz showed for the first time the formation of planets orbiting in the habitable zone of low mass stars such as Proxima Centauri, our next neighbour. These cool stars are the hot topic of exoplanetary science at the moment because they offer a unique opportunity to detect earth-like worlds like Proxima b. How could the surface of these planets look like? Current telescopes are not able to answer this question, but the computer models make interesting predictions. See: “Preferentially Earth-sized planets with lots of water”. From small planets to big ones: Judit Szulágyi at ETH Zurich, Lucio Mayer at the University of Zürich and Christioph Mordasini at the University of Bern teamed up to simulate the formation of giants like Jupiter with Europe’s fastest supercomputer at the Swiss National Supercomputing Center in Lugano. The results of the calculations give an interesting hint to observers of young planets: “To trace a gas giant’s birth, take its temperature”, summarized the Australian magazine “Cosmos” reporting about the PlanetS study. See: “How planets like Jupiter form”.